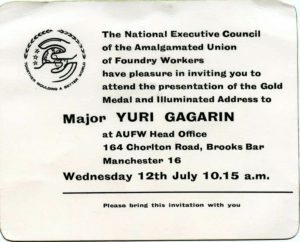 I will be speaking at the Chorlton History Group about Gagarin’s visit to Manchester on 12th July 1961. On his drive from the airport, Gagarin drove through Chorlton in his open top car – in the rain. The presentation will include a rare video (originally cine) film of Gagarin in Manchester and several unpublished photos. In attendance will be Joyce Baines who worked at the Old Trafford HQ of the Amalgamated Union of Foundry Workers, which was Gagarin’s first stop in Manchester. The AUFW invited him to the UK and presented him with a gold medal making him their first honorary union member. That is correct, Gagarin passed away many years ago. His historic spaceflight was on 12th April 1961. He visited Manchester on 12th July in the same year. He was was killed in during a training flight in March 1968. My talk on Thursday 7th July, a couple of days away, is an account of his life and visit to Manchester.